Pursue your passion. Discover your purpose. At Bethel University, we’re committed to excellence. But here excellence means something more. It means taking our faith in Christ and integrating it into everything we do so we can accomplish incredible things—in our careers, our communities, and our world. We offer more than 90 majors and dozens of cocurricular options, so students can take advantage of hands-on learning opportunities in their chosen field. With a 12:1 student-faculty ratio, you’ll get the individualized guidance you need to thrive—both inside and outside the classroom. We believe that education isn’t just about getting a degree—it’s about discovering a calling. Our faculty and staff are trained to help you discern your career path so you’re prepared to lead with confidence and serve with purpose. Here you’ll become part of a community of Christ-followers who challenge each other just as much as they support each other. With mentorship programs, prayer teams, and counseling services, we are committed to developing our students academically, spiritually, and socially. We don’t want the cost of college to keep you from getting an excellent education. Ninety-nine percent of our students receive financial aid, and the average aid package is $28,451. After learning all their options, seven out of 10 families say a Bethel education is within their reach. Our 247-acre lakeside campus is the perfect place for a sun-filled study break—or a game of late-night broomball when the snow falls. Arden Hills is just 15 minutes from Minneapolis and St. Paul, giving students quick access to one of the most thriving urban areas in the nation. With more than 30 international programs and a price tag that’s often no more than a semester at Bethel, we make studying abroad easy—maybe that’s why two-thirds of our students do it. Whether you study ministry in Greece, conservationism in Ecuador, or literature in Scotland, you can discover the power of firsthand experience. Royal athletic teams compete in one of the nation’s most competitive NCAA Division III conferences—the Minnesota Intercollegiate Athletic Conference. Whether it’s an alumni tailgate at the homecoming football game or a student white-out at a volleyball match, our 18 varsity teams embody the spirit of Royal Nation. 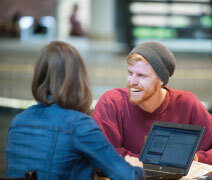 Ninety-nine percent of recent graduates are employed or in graduate school, and 94% of seniors rank their Bethel education as good or excellent. Bottom line? 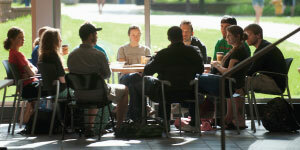 Students like Bethel, and so do employers.